Today’s leg of the A2B Journey started with quiet solitude and breathtaking scenery. By the end of the run, I was seeing signs of people and population as I was just entering Seligman, Arizona. 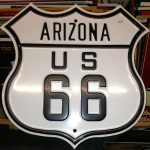 As I slowly made my way from desert silence to the waking up life of small town Americana, I noticed what influence that transportation systems, like the railroad and Route 66, had on the development of communities in the American West. So far, Route 66 has run parallel to a rail line. Most of these towns had been created and designed to support the movement of people and goods. When the railroads flourished or faltered, so did these towns. Upon the arrival of Route 66, their economies grew happily around a traveling America. Local business owners talk about the day that I -40 opened. Overnight, traffic on the Mother Road went from a churning river to a trickle. Many of the businesses and attractions closed as American culture shifted to a more hurried life. A few of the attractions still remain. These survivors along with the still-standing infrastructure and architecture provide a lingering, tangible snapshot of life during the heyday of America’s Main Street. Because of an early morning meeting for my day job, I got up extra early to get my run in. The early morning darkness was just starting to yield to dawn as I stretched. My muscles slowly made the transition from right-out-of-bed tightness and resistance to the feel-good release of a good stretch. I love how that feels. By the time I had finished stretching, there was enough morning light that I was able to dress in normal running clothes. I wouldn’t have to worry about lighted and reflective running gear. Four times during the run, I increased my pace in ½ to ¾ mile increments and then returned to normal pace afterwards. I hope to soon make the faster pace my new normal. I woke up in the middle of the night to the sound of a distant train blowing its horn. It was a happy familiar sound that I had not heard in some time. As I faded back into sleep, I could barely hear the rhythm of the train moving across the tracks. That happy memory-filled feeling was still with me as I awoke in the morning to prepare for my run. I decided to use the quietness of the early morning run to let my mind wander back to my childhood. There were some train tracks not quite a mile away from my home. There were countless nights that I fell in and out of sleep to the sound of trains passing by. As I ran, I could hear and feel in my mind the other sounds and sensations that surrounded those moments. In the summers, the sound of passing night trains rode on top of a great symphony of frogs, katydids, grasshoppers, birds, and water from a creek that ran behind the house. Occasionally, rainstorms would lend the percussive voices of raindrops and thunder. Honeysuckle and lightning bugs often added to the ambience. I also recalled the feeling of southern summer nights when the cool, humid air would gently fall on my head from the window just above the headboard of my bed. I always loved falling asleep that way. As I continued on my run, my thoughts turned to my grandfather. He loved the sound of passing trains. He worked for the railroad for 47 years. For him, it was the sound of people and work that he loved. My grandfather and I got to spend a tremendous amount of time together when I was a teenager. Without trying, he taught me a lot about selfless commitment and responsibility. And he was quietly hilarious! We had some of the greatest and most memorable times together. We happily destroyed an unbelievable number of boxes of Little Debbie snack cakes! I always knew he loved me. When he passed, I was a world away in Brazil. Even though I was far away, I missed him deeply. I still do. Towards the end of my run, I thought of my last memory of him. He was strong, vibrant, and energetic. I remember him laughing. He seemed almost youthful. I am thankful for our last conversation. I usually do not allow myself to dwell on the past much (unless there is lesson that I need to pull from the past). There is entirely too much to do today and tomorrow. However, I am glad that I made the exception to reminisce for a few short minutes this morning.